BUFFALO, NY (July 3, 2017) --- The Western New York Flash (5-2-0) are sitting in great position as they enter the home stretch of their schedule and look ahead to the playoffs. The team is riding a three-game win streak and is tied with the Inferno Rush at the top of the table as they return home for a doubleheader weekend. The Flash recently wrapped up a very successful weekend in Massachusetts, where they put up a 6-2 win over the Worcester Smiles and followed that the following afternoon with a 1-0 win over the New England Mutiny. 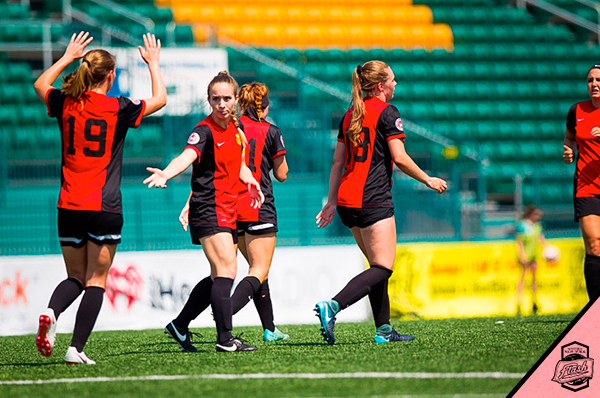 Four different players scored in the win over the Mutiny, led by newcomer Jamie Boyer’s hat trick performance. On Sunday, Carissima Cutrona put home the game-winner on a feed from Erica Hubert in the 85’ to give the Flash their fourth win of the year. This past weekend held the side in a battle for first place as they again hit the road to take on the Rochester Lancers, who were then in sole possession of first place. Cutrona again came to the rescue, opening the scoring in the 42’ on another feed from Hubert before adding the eventual game-winner in the 67’ to give the Flash a 2-1 win on a scathing hot day in Rochester. The University at Buffalo product leads the side with seven goals on the season. The Flash will return home this weekend as they host the Connecticut Fusion at 6:00 ET on Saturday, July 7, followed by a showdown with the Inferno Rush on the afternoon of Saturday, July 8 at 1:00 ET. The team will finish off their schedule on Saturday, July 14 in a rematch with the Rochester Lancers at 6:00 ET. All three matches will be hosted at Dobson Field at D’Youville College and fans can purchase tickets to the three games here.